The Chief KTP225 provides a rock solid, free-standing solution for graphic designers, broadcasters and other users who need to work with two side-by-side widescreen monitors. Provides ergonomic adjustability for hassle-free, fingertip positioning of each monitor. Position each screen separately for ergonomic, horizontal alignment. 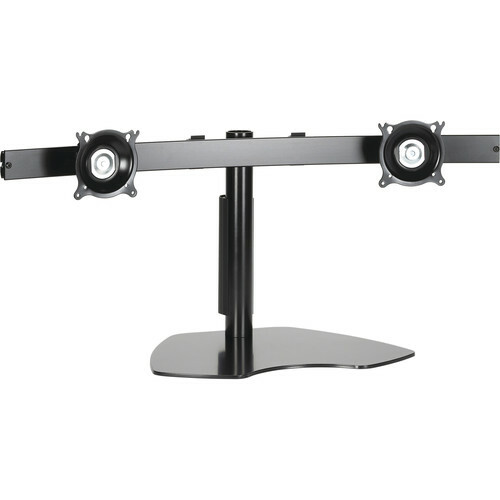 Maximum width per monitor is 30" and maximum height per monitor is 26"
Box Dimensions (LxWxH) 45.0 x 15.75 x 8.0"
KTP225S Dual Widescreen Monitor Table Stand (Silver) is rated 5.0 out of 5 by 8. Rated 5 out of 5 by Edward from Wish i had found this a year ago This holds my 27 iMac computer and Apple monitor with no problem. - Holds the weight with ease - Easily adjustable and many directions - Easy to assemble - Looks great - well packaged so doesn't arrived damaged After owning other stands with limited success I can say that this stand is great and will meet you needs if you need to mount two computers, yes computers not monitors. It will definitely hold two monitors with no problem but holding two computer is a totally different thing and this will do it at a great price. Rated 5 out of 5 by Anonymous from Great stand Very sturdy construction and easy to adjust the monitor tilt and location on the stand with just one person. I also bought the grommet and clamp accessories- highly recommend these accessories since they reduce the space the stand will take up on your desk (it is huge- flat.. but huge otherwise). The cable management tube is not the best, but it works good enough for what I wanted. Rated 5 out of 5 by Anonymous from Very Solid I love it. The only complaint I have is the cable management tube that clips on the monitor stand is not big enough to accomodate the 4 cables I have running thru it and it keeps popping off. Rated 5 out of 5 by Anonymous from Great Set-Up I bought two of these for my in home office; one for myself and one for my wife. Definitely saves space.Design is attractive and the items are very adjustable. Rated 5 out of 5 by Bilseville from Excellent stand This stand gave me more space on my desk. It was very easy to put together and the monitors and stand look very nice! Rated 5 out of 5 by Anthony from Solid and easy to setup I use this stand to hold my two 30 Dell monitors and it is excellent! Setting up the stand and attaching the monitors was very simple. I do, however, highly recommend thoroughly reviewing the instructions prior to beginning. Several models as well as horizontal or vertical installation instructions are all included in the same pamphlet. Total time from opening the box to having a stand with two 30 monitors attached and connected to my computer was slightly under an hour. For the Dell monitors the attachment bolts were already included on the monitor so I didn't need most of the mounting hardware included with the stand. Once assembled the tilt and sliding locking methods are pretty intuitive so getting the two monitors to align was straightforward. If you're attaching large monitors think through how you will attach and route your cables if your final location doesn't have easy access to the back of the monitor. I elected to attach all the cables prior to placing the stand in its final location and just wrapped the cables around the horizontal bar until the stand was placed into position. It was then easy to unwrap the cables and route them behind my desk and to the computer. Rated 5 out of 5 by Anonymous from Simple and Effective Surprizing easy to put together and incredibly strong. I'm glad I purchased it.